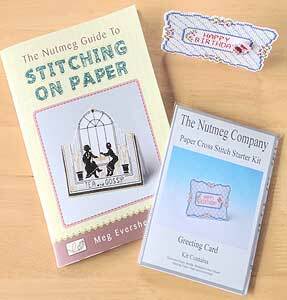 This booklet aims to answer all the questions we're regularly asked about stitching on paper. It covers the most frequently used stitches, how to cope with mistakes and problems, and finishing techniques, such as cutting out and using backing card. The booklet has a small kit tucked into the back cover, with materials for producing a greeting card. Alternative sentiments may be worked on the card, and are charted for you, or the materials may be used to produce something you design yourself. If you would like to work on stitching paper, but feel unsure, this should guide you through. We also have a special offer when you buy the booklet along with the Butterfly Box kit that matches the greeting card.